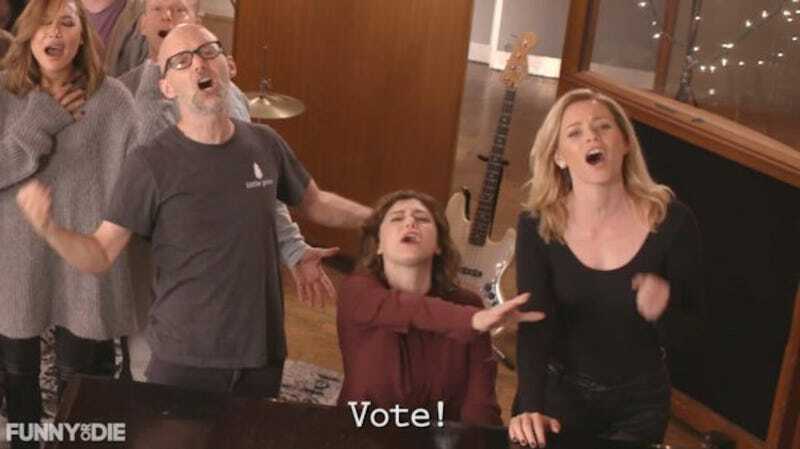 While you may not recognize her hands or face, Bloom—who won her first Golden Globe this year—has enough clout to get the likes of Elizabeth Banks, Patti Lupone, Jane Lynch, Jane the Virgin’s Jaime Camil, and more to lay down a track that’s begging—literally begging—everyone to get out and vote so that Trump doesn’t win the election. BLOOM: Look, obviously only Hitler’s Hitler. ADAM SCOTT: No one does Hitler like Hitler. PAUL SHEER/SEAN PATRICK THOMAS/MAYIM BALIK: But break up Mein Kampf into tiny parts and it reads like a Trump rant on Twitter! BLOOM: And if you need a refresher on post World War I Germany, they had an authoritarian political outsider stoking xenophobia in a nation where the poor felt marginalized, and blaming complex problems on scapegoated minorities! I know! That verse will be stuck in my head all day, too. Look, if hearing someone as endearing as Adam Pally shout-sing into a microphone about Donald Trump doesn’t make you want to go out and cast a ballot against him, at this point, I don’t know what will.